My interest in Hibiscus was pricked when we noticed Zimbabwean ladies picking leaves from suburban shrubs flowering on the sidewalks, and using them for cooking. We were given seed from the hibiscus family by one of our Zimbabwean security guards, and also watched his okra seed grow to produce those strange lady’s fingers, and the swelling buds of his cotton bursting open to present their downy fluff. However it’s the hibiscus that I have grown in the glasshouse that has really tantalised my tastebuds. 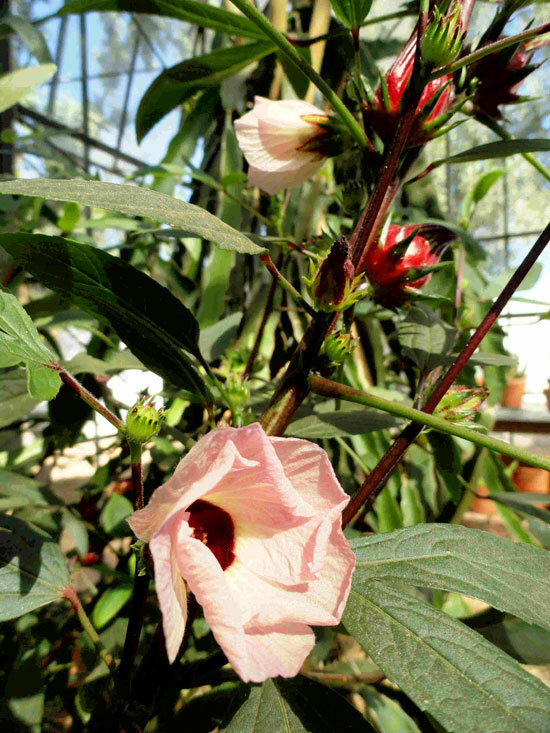 The Hibiscus Roselle (Hibiscus Sabdariffa) originates from Sudan, where they call it “karkade”, and the plant was domesticated around 4 000 BC. It is true famine food, as it is very drought tolerant. In famine stricken areas the seeds are actually ground to use as a coffee substitute or as flour to be used in soup or for making patties. Even though it is somewhat bitter, it is a good source of protein. 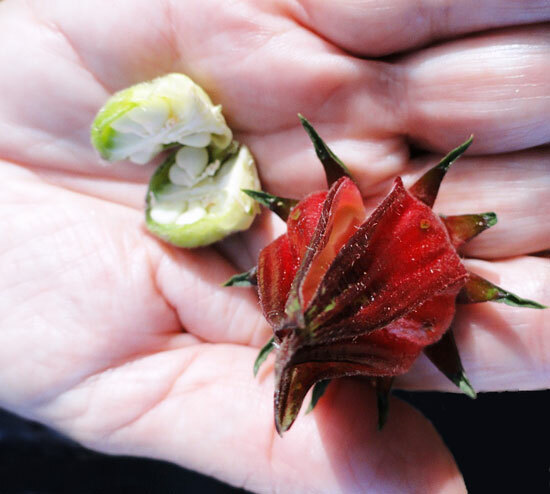 Hibiscus spread around the globe, as slaves took seeds with them, weaving hibiscus into the local cuisine from Jamaica – where it is drunk with ginger and rum – to Lebanon – they drink it with a sprinkling of toasted pine nuts – and even in Burma, where it is a sweet preserve. Most often, Hibiscus Roselle is grown as an annual, with the first two harvests cropped for their leaves – edible raw or cooked. Only as the summer days shorten do the Hibiscus plants begin to flower. The calix around the flower swells as the flower fades and turns into a ruby red jewel, and it’s this fleshy calix that I have begun to harvest to drink as a refreshing tea. The tea is equally good when made with a fresh or dried calix, seeds cut out, infusing hot water with a rosy glow and the perfect astringent pitch. It’s good to help soothe hypertension and colds, to clear mucus, to act as a diuretic, help with urinary tract infections and to aid digestion. If anyone would like to sample it, I am happy to cut a calix as part of our collection of fresh herbal teas. I also have plans to make a jar of sweet preserve with some of the calixes, and for that I will leave some seeds inside to provide the pectin. They say it’s a treat to drop one sweet roselle into a glass of champagne for a theatrical effect! If you are interested in planting this yourselves, you’ll need a warm spot, in order to grow large and provide generously. I bought seed from Shannon at The Gravel Garden. Looking for hibiscus sabdariffa seeds or plants! Can you help with a source! I live in the Swartland near Moorreesburg and are trying to establish a avenue of tall slender trees using the populis simone (chinese). After 3 years only 4 out of 30 trees manage to survive. Some of the dead trees have been replaced 3 times. The trees get a fungi that attacks the bark just under groud level. I have tried every remedy from commercial fugicide, jeyes fluid and cinnamon. Is there temedy that really works or can you recommend an alternative tree. Please skip those Chinese poplars(they are invasive) – it sound like Rosarium, a root born disease often seen as white mouldy hairs growing on the roots. It usually spreads from a nursery and then move in the soil quickly to other living materials. All those treatments are usually good – but the disease is stronger and you are only probably treating a section and it moves back in. Remove the trees and plant oats after the first rain on the whole area- they are great to eliminate soil borne diseases. Plant your new trees in end of winter and plough those oats in as green manure. Plant rue every gap in between trees to help them growing strong from the start. Hope you choose one of them and ask a close-by nursery to help source/grow it!